Study: Which nation talks about soccer the most in cyberspace? The study creates a league table of references to football in the run up to 2010 FIFA World Cup. 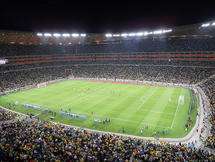 (PhysOrg.com) -- The 2010 FIFA World Cup has thrown up challenges for researchers at Oxford and Kentucky Universities. Using Google Maps they have settled scores on whether the term ‘football’ or ‘soccer’ is preferred across the world and kicked off a debate about which nation likes to talk about football the most. They discovered that of all the teams in the World Cup, Algeria has the highest proportion of user-generated references to football. Algeria has 120 references to football out of a total of 5489 indexed items (or 2.2 per cent of all content) in Google Maps in Algeria. However, England is close behind with the second-highest proportion of references to football out of any country in the world cup. (165,000 football references in England out of almost 8 million indexed items - 2.1 per cent of the total). They also found that there are twice as many references to ‘football’ (645,000) as there are references to ‘soccer’ (324,000) across the world. In languages other than English, there are more references to the sport in German (324,664) i.e. ‘fussball’ than any other language. Oxford University researcher Dr Mark Graham of the Oxford Internet Institute and colleagues from the University of Kentucky (Dr. Matthew Zook and Taylor Shelton) used ‘football’ and ‘soccer’ as the search keywords on a world grid with co-ordinates 1/4 degree apart to see which places on Google Maps threw up the most results. Using specially written software programmes, designed by researchers from Oxford and Kentucky Universities, they conducted searches for ‘placemarks’ - the digital equivalent of ‘a pin on a map’ - which carried user-generated references to football or soccer. They also trawled Google Maps on approximately a quarter of a million geographical coordinates for user-generated content that mentioned ‘football’ or ‘soccer,’ for example football teams, football playing fields, bars and hotels showing football on TV. The data was collected in March 2010 from 260,000 global points. Their analysis finds that much of the Arabic and the English-speaking part of Africa scores highly in its proportion of references to both football and soccer. A quick sample of the hits for ‘football’ and ‘soccer’ in a few different African cities reveals a range of geographic associations with the terms: bars that show football, soccer pitches, conversations that were had about football, recorded memories of a soccer game that took place, and of course references to the World Cup in South Africa. Yet it remains unclear why Libya, Sudan, Tanzania and many other countries on the continent also score highly. In some cases, a large number of hits for either ‘football’ or ‘soccer’ seem to be correlated with on-the-pitch successes (either historical or contemporary). Ultimately, Australia wins the prize for having the widest spread of footballing references and English appears to be the dominant language for references to the sport in most parts of the world. Dr Graham said: ‘As England prepares for its match against Algeria, the results from this research project provide football fans with topics to debate off the pitch. However, this research has a more serious purpose when it is applied to other areas. We can ultimately map and measure the many ways in which our offline, material world is being represented on the internet. Study asks how safe is high school football?